Exclusive to The Fragrance Shop. Introducing Salvatore Ferragamo UOMO Casual Life. For the man who is confident, free and modern. Crunchy, green violet leaves are laced with cardamom and lemon for an immediate vibrant freshness. These give way to geranium and coffee which give an energetic and invigorating heart to this new, stylish and refined scent. 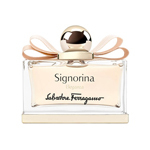 A dry down of cashmere wood, white cedarwood and musk complete this sensual Woody/Green Salvatore Ferragamo fragrance.